As already announced in our previous blog entry, we will have a closer look into the two ALL IP approaches: migrating the ISDN PBX or replacing it via a new IP-based voice and data solution. Migration means continuing with the already existing PBX whilst a media gateway takes care of the ISDN connection from the PBX’s point of view. 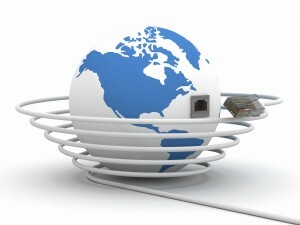 The biggest advantage related to migration is that the PBX remains unaffected. In this process the media gateway will be positioned between PBX and the ALL IP broadband connection. It is very important to use a professional media gateway unifying all necessary interfaces and features. Sophisticated QoS (quality of services) mechanisms are in this case especially important as it guarantees the required voice quality and the solution’s reliability. One of the basic requirements is of course the available bandwidth. 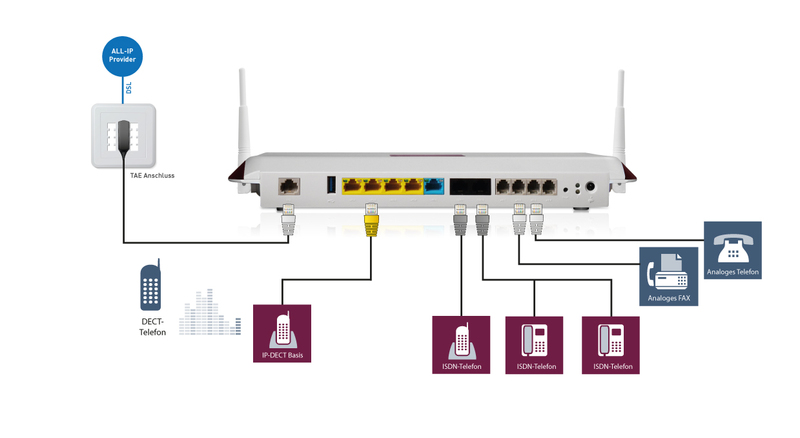 As a rule of thumb, a good voice quality comparable with ISDN can be obtained by allocating 100 kbit/s for each voice channel, bidirectional for up and downstream. Also qualitative parameters such as delay, jitter and an acceptable level of package loss have to be evaluated. For instance, losing 10 coherent data packages at a stretch, can lead to losing 100 to 300 ms of voice information. In order to have a smooth operation for incoming and outbound calls, the media gateway converts ISDN voice data into IP data and vice versa. The same applies to the communication of the ISDN PBX behind. It is important to note that all data coming from or transmitted to the ALL IP platform has to be conformed and compatible with SIP which is the network protocol being used. SIP (session initiation protocol) is in charge of the control as well as the set up and dismantling of the connection. The voice data as such is transmitted via the real time protocol (RTP). Experience shows that SIP is not the same as VoIP and VoIP is not the same as ALL IP. A simple example: The ALL IP service provider sends phone numbers in a canonical format which means that the customer number being called is for instance +49-91-196730. Without the media gateway converting the format into 091-196730 before sending it to the ISDN PBX, it is very likely that none of the phones connected to the PBX would ring. Vice versa, the same applies when calls are made from the ISDN network to the IP network. If the ISDN PBX which is already installed should not migrate due to technical or economic issues, then the PBX has to be replaced and an ALL IP voice data solution has to be found. However, one has to take into account that with an ALL IP solution, not only the PBX may lose functionality, but also the terminals may only be used partially or not at all. In this case new IP terminals have to be integrated. This is a cost factor not to be underestimated, especially in companies with a larger number of digital and often proprietary system terminals. However, a complete and thorough IP-based infrastructure offers plenty of opportunities to optimize working processes and thus achieves an economical benefit. Numerous features such as DECT over IP, voice mail, IP-based door intercom including camera image of visitors on IP terminals or smart phones can be seamlessly integrated and used via professional ALL IP communication solutions. Now, wireless LAN or HotSpots for guests and customers as well as integration of home offices or mobile employees can be effectively combined. Teldat as a qualified ALL-IP partner for SMEs, large corporations and integrators has attracted the service provider Deutsche Telekom as a customer by its various ALL-IP solutions for both approaches, migration as well as new ALL-IP solutions. While VDSL2 and vectoring have already been launched as a service, the technology G.fast can get even more bandwidth out of copper cables. However, this new technology which was introduced at the end of last year by ITU, also has its drawbacks. Along with the two standards G.9700 and G9701, ITU has approved a further bridge technology for the “last mile”. This technology is expected to offer the end customers high-speed data via copper cables which has been so far only possible via fiber optic connection. Like VDSL2 and vectoring before, G.fast enhaces again the possible bandwidth based on copper cables, however, only on very short distances in a satisfactory manner. G.fast derives from the Recommendation ITU-T G.fast-psd and stands for “Fast access to subscriber terminals (FAST) – Power spectral density specification”. Currently, this technology is expected to provide the end user with bandwidths of up to one Gigabit per second. Up and downstream, of course, have to share bandwidth. G.fast uses also higher frequencies than other previous standards. While VDSL bandwidth is up to 30 MHz, G.fast has initially a bandwidth of 106 MHz – the doubling to 212 MHz is already planned. However, high frequencies also may cause issues concerning susceptibility and coexistence with already existing xDSL connections. Operating VDSL2 and G.fast in the same broadband bundle simultaneously is comparatively easy. In order to avoid a crosstalk during the transmission of both standards, G fast has to use higher frequencies than VDSL2. In addition to the start frequencies of 2.2 MHz and 8.5 MHz, ITU defines therefore also the entry points of 17,664 MHz and 30 MHz. Apart from crosstalk, G.fast struggles with dampening effects which limit the length of cables. According to ITU, only lengths below 100 meters allow data rates between 500 and 1,000 Mbit/s. 150 Mbit/s still remain with a lenght of 250 meters. Thus, this technology is suitable as an addition to FTTP and FTTdp (Fibre to the Building/distribution point) networks. It will take some more time until G.fast will be put into practice. So far none of the large carriers has concrete plans concerning the introduction of this technology. However, the constantly increasing demand for bandwidth makes this technology a very promising and interesting topic and will continue to draw our attention in the future. 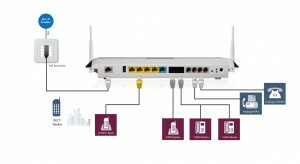 As an innovative manufacturer of network routers Teldat of course is engaged with this subject and is looking forward to the future developments. Mobile Internet becomes more and more popular. Whereas mobile Internet has only been used for email checking, it is now used for the same applications as the Internet by cable: surfing the Internet, playing online games, listening to music or streaming videos and films. 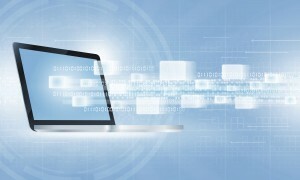 In addition to this trend there is a further development: The Internet of Things on which more and more devices are connected to the network and among each other. For this increasing demand, the capacity of the 4G standard will not be sufficient anymore.